Insta360 has launched its new camera, the Insta360 ONE. Here are samples, specifications, and amazing features — there are a ton of them — and why it could become the best 360 camera under $300. Update: added compatibility info for Android, stitching information. Change log at the end of the article. – shutter speed as slow as 60 seconds! But Lok Cheung tried the ONE with his iPhone 5S and it worked. I’m trying to find out re Android compatibility. 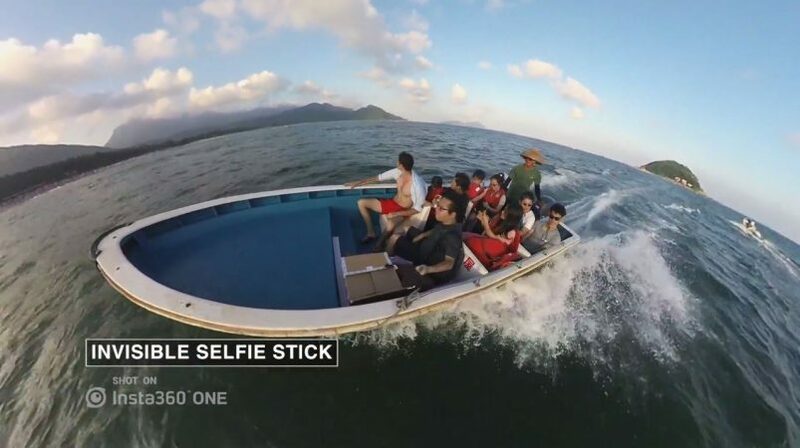 – Invisible selfie stick: the Insta360 ONE has a selfie stick accessory that is specially designed to be invisible to the camera, making it appear as if you have a flying 360 camera. 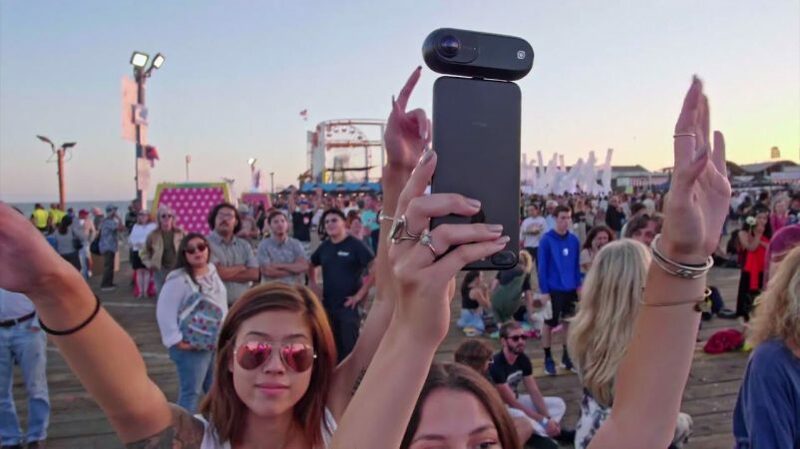 – FreeCapture: with this feature, a single Insta360 One camera can capture all angles simultaneously, enabling it to simulate a multi-cam setup. The Insta360 One has this capability built into its app. Here’s how it works: after you record a 360 video, you can create a non-360 video out of it by moving your phone as if you had been recording the original scene with your phone. It’s like time traveling! 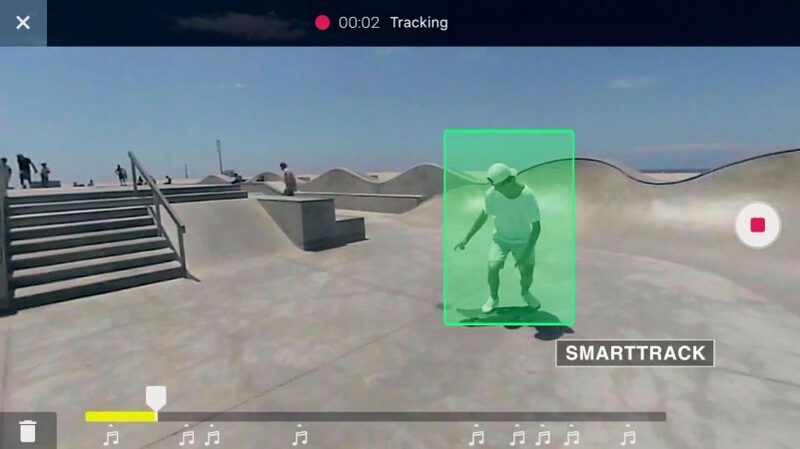 – Smart Tracking: with this feature, you can create a non-360 video where you identify a subject, and the camera’s view will track the subject as he or she moves around the video. 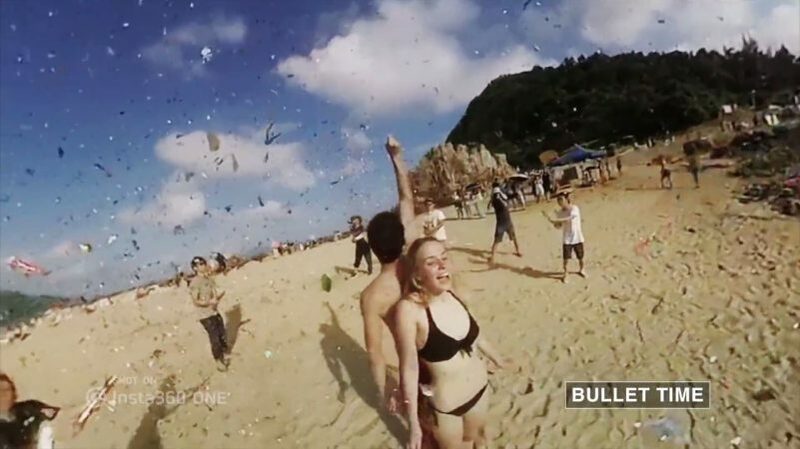 – Bullet Time: This is a super slow motion effect, either at 60fps or 120fps (hemispherical). The desktop software can interpolate 240fps from a 120fps video. With this feature, you can swing the camera around as the camera records in high speed and create a bullet time effect, similar to this video I made. 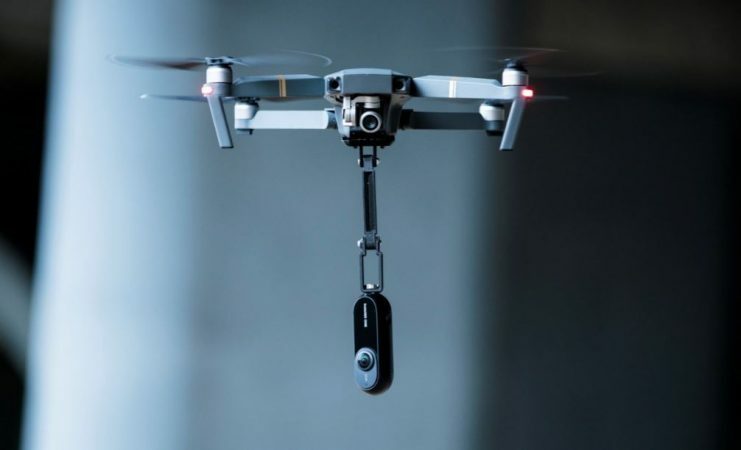 Because the Insta360 ONE has stabilization, you won’t need an external wing or stabilizer to keep the horizon level as you spin the camera around. 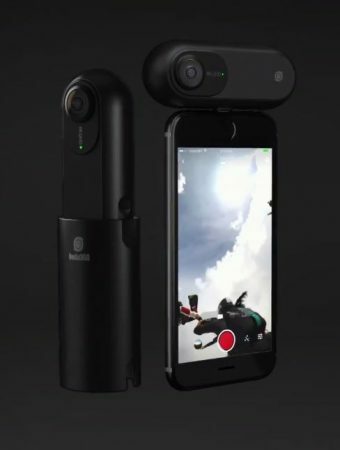 The Insta360 ONE includes a 1/4-20 tripod attachment with a string for the bullet time feature. – full manual exposure (ISO, shutter speed, exposure compensation, white balance, etc.) with shutter speed as slow as 60 seconds — long enough for night sky photos! – true multi-shot HDR mode. Stitching: Photos and videos can be viewed fully stitched on the app immediately after taking them. However, they are not stitched until they are exported. In this sense, it’s similar to the Insta360 Nano and Air. Ever since I posted a video demonstrating the Xiaomi Mijia Mi Sphere’s image stabilization, there has been a steadily growing consensus that the Mi Sphere is the best 360 camera for consumers. But the Insta360 ONE is poised to take that crown away from the Mi Sphere. Simply put, the Insta360 ONE has all the features of the Mi Sphere and adds several others (higher 4K resolution, 4K live streaming, RAW photos, LOG videos), including cool features most users hadn’t thought of, but will find useful. Moreover, the direct connection to a phone is critical feature that conveys an important advantage: not only does it facilitate sharing photos and videos, but when live streaming, the phone’s Wi-Fi can be used for the internet connection, while the camera is connected via the lightning port. I will be posting a comparison between the Insta360 ONE and the Mi Sphere (and other 360 cameras). When Insta360 announced the ONE, I made 10 predictions. How accurate were those predictions? See for yourself. “1. It will have in-camera stabilization, and the stabilization will not require a phone.” Correct. “2. It has two lenses and will be fully spherical, 2D not 3D.” Correct. “3. it has a high-fps mode (at least 240fps or higher).” Mostly correct. It has 120fps, and 240fps interpolated on desktop. “It appears that this is a fully spherical high fps mode (not just a front lens mode).” Sadly not true. At 120fps, it is only hemispherical. “4. It is a compact consumer camera (not a professional 360 camera).” Correct. “5. It will have its own memory and storage.” Correct. “6. Excellent stitching. … The camera will likely have an optical flow mode.” Seems to be correct. Yes it has optical flow. “7. Excellent dynamic range.” Still unknown. “8. It will be at least 4K and more likely 5.7K.” Mostly correct. It is 4K. Sadly not 5.7K. “9. It is probably slim.” Somewhat correct. ONE has an elongated shape. but it is not very thin like Theta or Xiaomi. – For more information and to stay updated, please join the Insta360 ONE Community on Facebook. I’ll post all new info there. added sample 360 videos and 360 photos in full resolution, added link to new Facebook group. Just wondering if it has an intervalometer? Hi Adam. I don’t know yet. I will try to find out. Hi Adam. Yes it has an intervalometer. Minimum interval is 5 seconds. Did they say the manual exposure time? 30 sec? 1 min? I don’t know yet. I’ll find out. The shutter speed can be as slow as 60 seconds but the current version of the app does not yet have manual exposure. I believe they will add this in the future. edit: correction – the app now has manual exposure! Very interesting. Great price. GoPro Fusion “overcapture” feature similar to this. But late to the party. Insta360 is a awesome company and this is an awesome camera! BUT: The gap left between the camera and the phone is an absolutely tragic design flaw! It will break off the lighting connector on the camera, or on the port of the iPhone, or both, INSTANTLY AT THE FIRST JOLT OR STRESS! Just want to know how does the still image quality compares to the champion from Xiaomi!